Whether it is for a personal project or to kickstart an online business, one can certainly benefit from learning how to make a logo online because it’s convenient and wouldn’t cost as much as hiring a professional service. Most software have some kind of templates to get things started so let’s walk through some designing criteria and see what type of programs are available before we transfer the final piece to your WordPress website. Since most of us don’t have a designing background, it’s good to follow some guidelines as to what constitutes an ideal logo for branding. First and foremost, a logo should look SIMPLE in terms of graphic and art. Using two to three shades of colors should be sufficient to make it look presentable without over complications. The design should also be MEMORABLE in a way that people can relate to visually and UNIQUE from other brands within the same niche. Most importantly, the overall impression of the logo should be RELEVANT to your business goals and the audience that you are engaging with. Wordmark – This design uses the entire wording in a brand to display as a logo, for example Disney. Lettermark – This design uses only the initials of a brand, such as the case of IBM. Brandmark – This design is what most of us can relate to – a brand in the form of a graphic image – like the company, Apple. Iconic – This design uses a combination of words and graphic to represent a brand, such as Dunkin Donuts. But before we go into the designing process, let’s see what is the basic requirement of a WordPress logo. WordPress has more than 2,000 free themes that can be used for a variety of online ideas and each has its own layout structure; some are more customizable, some are not. When it comes to using a logo, you want to choose a theme that can accommodate for this. 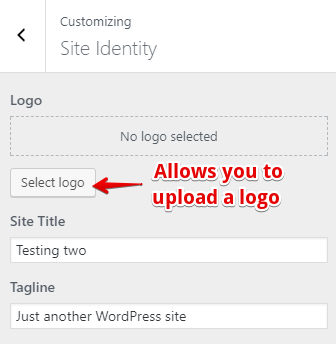 To search for this feature in a particular theme, go to Appearance ⇒ Customize at your WordPress dashboard and look for a tab that says ‘Site Identity’. This is usually the section that is related to a website branding and you want to make sure that it allows you to upload a logo. If it doesn’t have the ‘Logo’ section, that means you are only limited to using a site title and a tagline – no graphic design whatsoever. Once you’ve identified a theme that allow this feature, click on ‘Select Logo’ and a new window would pop up to suggest you the image size and the dimensions. While most file size allows up to 32MB, the dimension specificity is bound to be different from theme to theme. For example, a 240 x 240 pixels will produce a square shape logo and a 290 x 70 pixels will give you a rectangular size. The importance of understanding this is that you don’t want to dive right into designing only to find out later that the logo doesn’t fit into the WordPress theme that you want to use. Another dimension to pay attention to is the Site Icon, which can also be found under the Site Identity tab. This image is basically the Favicon that appears on the tab browser whenever someone visits your site. Most WordPress themes uses 512 x 512 pixels, so you may also want to create an icon resembling your logo for this particular measurement. Alright, enough with all the theories – let’s see how we can actually create a logo from scratch using some interesting software. Canva is a tool that I often use for creating graphics on my website. It’s multi functional and you can actually get a lot of work done for free. They have a lot of marketing material templates and if you are looking to create a square logo, the default size available is 500 x 500 pixels. When you are on the logo editor, there is a ton of free layouts to be found on the left hand panel. Simply select one that you like and that design will be automatically transferred to the white canvas editor on the right. As you can see in the example above, I’ve selected an iconic design (the combination of words and graphic) and even tweaked the elements (color, font, size) to make it different from the original piece. Once you are happy with the final result, download the logo and save it in PNG format. Since this measurement is already the same as the one we want to create a site icon, I proceed to remove the wording elements and just retained the graphic. I have also enlarged the graphic size a bit so that it filled up the extra space and this is how our favicon looks like. Both of these logos are now ready to be uploaded to your WordPress theme. If you are looking to create a rectangular logo instead, you could use the custom dimension feature on Canva. Simply go to Select a Design ⇒ Use Custom Dimensions and enter the pixel measurements that you want. However, when using this feature, you wouldn’t have access to the free layouts like the one you get on the logo editor, but don’t worry. There are plenty of designing elements (frames, shapes, icons) that you can use on the left hand panel so learn to be creative and come up with something unique for your brand. If you like to know more about using Canva, please check out this video class from my recommended training platform. While free designing tools are great, sometimes they may not have the originality that you want. In such cases, you could consider using paid designing tools instead and one such software is called Logojoy. Logojoy uses an artificial intelligence program to create a logo that is tailored to your desired color, style and layouts. It also allows specific symbols to be used for better representation of your brand. Using these combinations, the program will come up with several logo choices for you to select from. If you are happy with the design and only wanted a single file, you can purchase the soft copy for $20. This dimension gives you a 1000 x 1000 PNG logo, which can be edited to whatever size you want to fit into your WordPress theme. If you want higher resolutions files, social media materials and professional support, then the premium (at $65) or the enterprise (at $195) would be a better choice. For starters, I think the basic package is really more than sufficient and if you know how to do simple editing, that could save you a lot of money. What Is Your Logo Inspiration? Creating your own logo is one of the most exciting parts of turning an online idea into a reality, so I do hope that this quick tutorial has benefited you in some ways. Have fun with the process and visualize how you can use a brand to transform your goals into something successful for the long term. While we are on the topic, would you like to learn more about starting your own online business? Have a look at what Wealthy Affiliate has to offer and do get in touch with me if you need any help. Hope to hear from you soon. Questions – What challenges do you face when creating your own logo and what type of software works for you? Please leave your thoughts and comments in the space below so that we can interact. This article came just in time as I am currently looking for new ways to improve the design and overall visual aesthetics of my website. I’ve been using the current logo for more than a year now and I think a subtle, but a fresh and exciting upgrade nonetheless would be good for a logo change. Prior to reading this article, I didn’t know about any of the designing tools, therefore I am happy that I’ve stumbled across your article so I can finally learn about one and try it out in action. I think a free designing tool is a perfect solution for people like me who are not really interested in learning how to use professional image editing programs, and are searching for something more simple, easy and quick to use. I am impressed with Canva’s user-friendly format, their huge variety of distinctive image design selections, and I’ve also found custom dimension feature to be really cool and useful, as it allows for unique logo design creations of different shapes and sizes. Thanks for such informative and detailed article. I truly found it to be very helpful and hopefully, it will benefit other people too. I too follow your tips in designing logos. Keeping it simple and making sure that your WordPress theme allows logos are both important to take note of. I already have a logo, but if I am ever redesigning it, I will check out Canva for sure. Question – If you create your own logo or use a free logo, is there any way to protect it or claim ownership for the image? Hi Renton, if you want to give copyright to a logo you designed, you need to register for a trademark. It will cost some money, but it’s feasible. As for free logos, I don’t think you can actually claim ownership because it’s meant for the public use in the first place. I’ve used Canvas to create infographic on most of my reports/a book while I was still in college. It’s really a good tool for graphic design. There are tons of templates available for almost everything you want. Another interesting thing is that you can upload photos/images and edit the available template to get a more unique design. I recently used it to design my website header image. I haven’t used it to create my website logo because I’m not sure which logo/design I should go for. I may have a peek at Logojoy and see what’s there. I have used Canva before for constructing original images for my blog posts, and I love the way it’s a free platform. However, I had no idea that you could create logos with their features. So thank you for that! Finally, I can get rid of my generic WordPress title on my website and replace it with a dynamic logo. Can’t wait to give it a try. Thank you for the tips. I have a question about logo creation. Is there any benefit to using a free logo on my website? A free logo is generally easy to make and if you want a design that can pop up right away, I don’t see why not. The only risk I can think of is duplication whereby someone else also uses the same logo for their sites. That wouldn’t feel very professional. the criteria for a good logo design and will see what Canva can bring to my blog. Thanks for the input. I am at the process of creating a logo for my business, but didn’t really know what kind of program to use. I am not a pro designer or anything so it’s cool to learn that I can actually make one using a simple tool like Canva. I will check it out. Thanks for the recommendation. Actually I’ve been using Canva – the mobile application – for about 2 years now, and I never knew they it has a desktop version where one can create all kinds of graphics work. Thanks for bringing this to my notice. My blog is still very young with no content yet. So this instruction on logo creation has been very helpful. Hi Cathy, I was looking online on what tools are available to make a logo, and found this article. Canva is a fantastic tool and I have used a lot in the past but, I don’t know what happens with it, it seems that it doesn’t offer as much as features as it used to. For example, I don’t see the button options anymore; I only see a few buttons that are not customizable. Did you pay attention to this? Anyway, do you know any other alternatives to Canva? Thank you. Canva had some make-over recently so that’s probably what you were experiencing at that point. I am a regular user and as far as basic features are concerned, they are all still there. If you want something different, you can always check out the Stencil app. It’s more lean and better at escalating image processing. Hope this helps. Cathy, thank you for these very easy to follow instructions on how to create a logo and a Favicon. I did not realize the two were different, neither did I know that you can upload a logo so easily onto WordPress. I had heard about using Canva, but Logojoy is new so I will need to take a closer look at it. Do you think it is better to have a logo for a blog site or just your own image? I tend to prefer doing the latter. Hi Judy, if it’s a personal blog that you share with friends and families, using your personal image is absolutely fine. But if you are creating a blog to monetize from any type of offers, then you are basically running a business and I think having a professional looking logo would be more appropriate. This is a clear description of how to design a logo online. I just paid for mine about three days ago and I am so excited about my new logo. I used a paid service which is basically the same process as you have explained. I just wanted something professional that can bring out the brand for my business. Having a logo is a must for modern websites. The logo for my website was created by a friend, so I didn’t have to do one myself. However, Canva’s tool for creating logos seems great. I will try it, not only for logos but for images as well. I am currently using Pablo by Buffer for images. Highly recommended. Check it out! Great post on creating your own logo. Canva is an amazing website. Have you ever used PicMonkey? I’ve done both and find them to be good, but depending on what you like, you may pick one over the other. If you don’t do the paid version on PicMonkey, it can be annoying. I don’t find that as true with Canva. Hi Jessica, I’ve used PicMonkey for a short while and it was just okay. Canva on the other hand, is more inclusive and user friendly in my opinion. I get to do a lot of designing work for my blog at free cost. I have been using Canva for creating infographics, but to be honest – I didn’t notice the option to create logo there up to now. I like working with Canva as it is very easy and simple. So finally, my website will have a nice logo 🙂 and this is just thanks to your article! I also learned a few things from the logo creation tips. Very helpful indeed. Hi Cathy – thanks for these tips and also the website recommendations. I don’t have a logo for my business yet, and it’s something I’m considering. By the way, did you use one of these software options to create your drawn facial image? I love it – it’s so unique and different from a photo. Yeah, it’s kind of cool, right? 🙂 I actually used an app for creating that ‘cartoonish’ facial image. It’s called MomentCam – you can get it on Android. Thanks for this article regarding designing our own logos. I am pretty nifty when it comes to all things blogging. In fact, run quite a few sites and freelance a lot on Upwork as a WordPress security, speed and debug specialist and consultant. But when it comes to logo’s and using design apps, I am just horrible! Even with Canva, many swear by it, but it just makes me wanna throw my laptop around in a fit of rage! (Which is some going for a guy that is normally as calm as a Hindu cow!). Do you have some kind of super easy made for 10 year old and complete newbies tutorial regarding the use of these kind of graphic design sites? Canva is by far the easiest tool and place that I can think of in terms of learning simple designing without any experience. A lot of the commands are very intuitive, it’s almost like using your smartphone or apps really. Instead of pushing you through another tutorials or guides, I think it’s more practical to throw yourself into the Canva dashboard, explore all the designing tools that are available, make a lot of mistakes (no one is going to judge you) and see what you can come up with.